All lions are fierce, right? 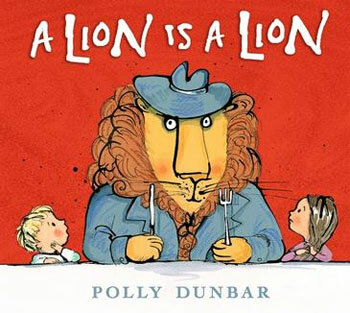 From the creator of Penguin and the Tilly and Friends series comes a wicked, rollicking read-aloud which asks the question: Is a lion still a lion if he … wears a hat? And carries an umbrella? Is a lion still a lion if he … arrives at your door and invites himself in with a 'How do you do?" (Isn't he polite!) And is a lion still a lion if he asks for a dance? What about when he licks his lips and says, 'Oh yes, lunch would be lovely, thank you..." Is a lion still a lion then? Polly Dunbar is the author-illustrator of Arthur's Dreamboat and the bestselling picture book Penguin, winner of numerous awards including the Book Trust Early Years Award and the Red House Children's Book of the Year. She is also the illustrator of My Dad's a Birdman, written by David Almond, and Shoe Baby and Pat-a-Cake Baby, both written by her mother, Joyce Dunbar. Her collection of titles beginning with Hello Tilly was made into an animations series, Tilly and Friends, as seen on Cbeebies. She is the co-founder of Long Nose Puppets, a children's theatre company. Polly lives in Beccles, Suffolk.